The focus for San Diego County social workers is on strengthening families. Every day they are out in the community working to ensure that foster children are able to stay with or reunite with their families or relatives. It’s a job that doesn’t always fit nicely into an 8 a.m. to 5 p.m. schedule. And even beyond their job duties, many of our social workers volunteer in their communities doing everything from one-on-one mentoring to a variety of efforts with organizations that touch on every segment of our society. 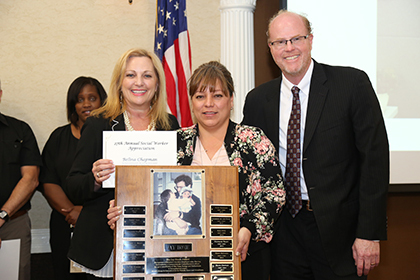 Every year during Social Worker Appreciation Month, the County’s Child Welfare Services honors a social worker with the Jay Hoxie Award for demonstrating a compassionate commitment to others through volunteer work in the community. The award is named after social worker Jay Hoxie, who died in a tragic car accident in 1990 while on the job. The 2017 recipient was Belina Chapman, who specializes in work with local Indian tribes. Chapman volunteers several hours a month with the Juvenile Diversion Program which serves first-time juvenile offenders and youth at risk for gang involvement. She is a “go to” person for churches in Escondido looking for assistance for immigrant families. You will also find Chapman volunteering with Interfaith Community Services during the holidays as a food bank worker, food server or greeter at holiday events. Chapman also spends time contacting various agencies and local recreation programs to obtain scholarships to allow local youth without the financial means the opportunities to participate in activities such as karate or dance. “I have kids as well so I’m a family person,” said Chapman. “Because of that, the community gets to see me a lot. Dena Stoltz established an outreach program known as “Kidz Club” to target at-risk youth. She’s volunteered at her church for the past six years, plans ongoing fundraisers and events so children are able to attend camps and takes the time to obtain school supplies for the children on her caseload. Aseel Ross actively sought opportunities to work with the Middle Eastern community by joining the Newcomers Collaborative. Last year, she participated in the International Child Maltreatment Conference in Kuwait and will be a speaker at the San Diego International Conference on Children and Family Maltreatment in 2018. Shameka Clark volunteers her time with the Black Military Wives Club helping new spouses arriving in San Diego County with resources and support. Clark is also involved in the Casa Colina apartments for the disabled and seniors, transporting residents to the grocery store, reading to and baking for them and providing household assistance. Jonathan Ogle and his wife love dogs and wanted to give back to the disabled community and veterans experiencing PTSD, so they have been providing service dogs to those in need for the past 15 years. They raise the dogs to 18 months, training them along the way until they are ready for their new owner. Kelly Barron and Joanna Khurshid were recognized from the CWS foster care eligibility for outstanding customer service. 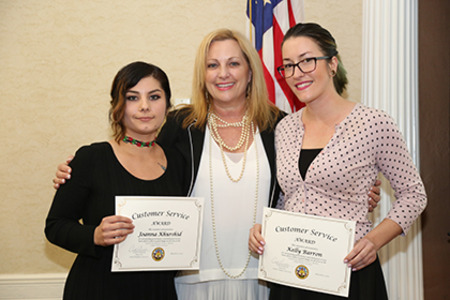 Janna Khurshid, left, and Kelly Barron, right, were honored for their customer service. CWS Director Cathi Palatella is in the middle.2017 Jay Hoxie Award nominees Deana Stoltz, Aseel Ross, Belina Chapman, Jonathan Ogle and Shameka Clark.